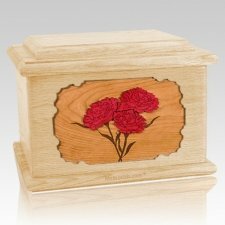 The Carnation Memory Chest Cremation Urn is made from maple wood and finely crafted pieces featuring a breathtaking, realistic nature scene, expertly carved into three dimensions using up to 7 kinds of wood. There is no paint on this urn. This will be a beautiful family heirloom for generations to come. It is master crafted in the United States by some of the most talented woodworkers in the nation. Bottom opening panel attaches with screws. The urn has a lid which can be opened and features a memory chest in the top part, which will hold pictures and other small memorabilia of your loved one. Take sometimes a little extra time even if Expedited (handmade)! 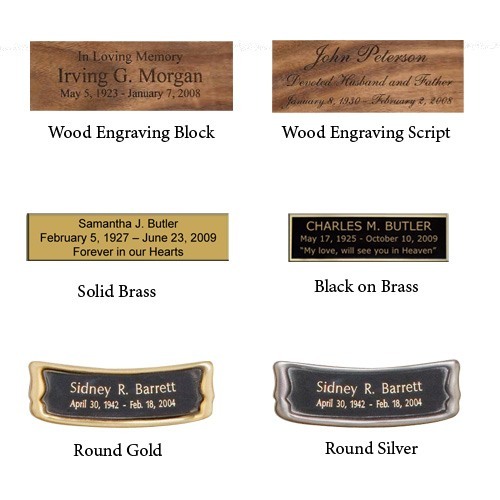 If direct urn engraving is selected, it will be on the top of the urn. The Round Plaques only hold 2 lines of engraving in block lettering. "This garden bench is installed in our memorial garden which is located in our own yard, to be used by both my wife & I at the time of our demise."